Like Gisela Graham? Click here to view the entire range. Treat your mum to her favourite beverage in in this ‘Lovely Mum’ mug from Gisela Graham. 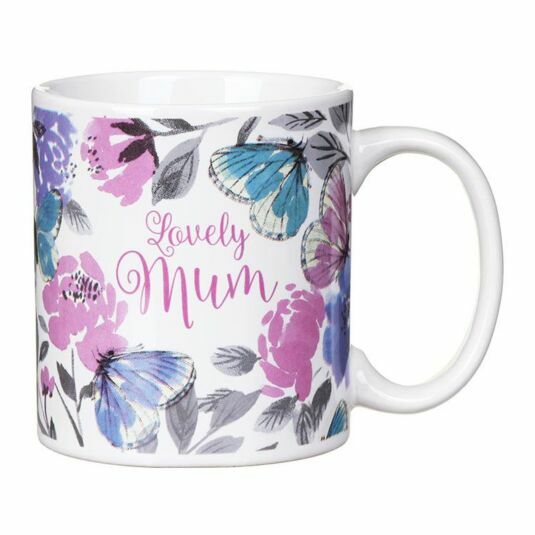 The mug is decorated with a pattern of butterflies and flowers in colourful shades of pinks and purples which complement the message in the middle. The words ‘Lovely Mum’ are written in a dark pink with a script design. This mug would make a beautiful gift for any mother on her birthday, Mother’s Day, or just to show her how much you appreciate her.